Astro Buildings are engineered for maximum strength from top to bottom and are used in all types of settings for a wide variety of purposes. 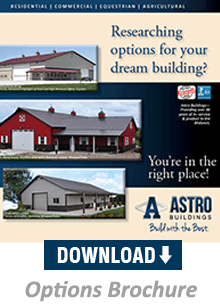 Get started with the Build with the BEST—Astro Buildings Brochure, then click on the download links below to start learning more about our custom designed Astro Buildings and how we can satisfy your building needs. If you are interested in getting a quote for your building, click here.